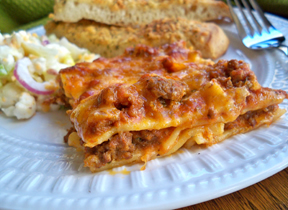 A spin on classic lasagna that uses Cheddar cheese on top instead of mozzarella cheese. 1 1/2 jars spaghetti sauce - 20 oz. Fill a large pot with lightly salted water and bring to a rolling boil over high heat. 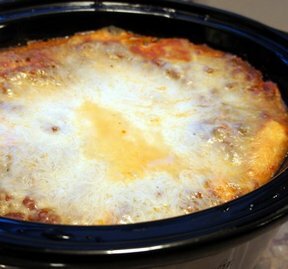 Once the water is boiling, stir in the lasagna noodles, and return to a boil. Cook the pasta uncovered, stirring occasionally, until the pasta is slightly tender but not cooked through, about 7 minutes. Drain well in a colander set in the sink. Meanwhile, cook and stir ground beef in a large skillet over medium-high heat until beef is browned; drain, then stir in sauce. Set aside. Combine 2 cups of mozzarella cheese, 1/2 cup Parmesan cheese, 1 container of ricotta cheese, and 2 eggs in a separate bowl. Pour about 1/2 cup of the sauce mixture in the bottom of a glass pan and cover with a layer of noodles. Sprinkle about 1/4 of the cheese mixture over the noodles, then ladle about 1/4 of the remaining sauce over the cheese. 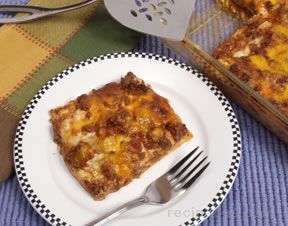 Repeat layering, ending with a layer of sauce and topping with the remaining 2 cups of cheddar cheese. Cook on 350 degrees F. for 25-35 minutes.